It's no coincidence that Abingdon keeps appearing on lists of the artsiest small towns in America. Virginia's most famous theatre is located on Main Street in downtown Abingdon. After more than eight decades, Barter Theatre is still the epicenter of Abingdon's cultural life, which also features live music, world-class museums, galleries, and a variety of working artists' studios. Immerse yourself in world-class cultural experiences and authentic Appalachian arts with a visit to Abingdon, Virginia. Start your trip with historic charm and the comforts of home by making a reservation at one of Abingdon's Bed & Breakfasts. Once you've arrived and settled in, head over to Wolf Hills Brewing Co. to sample our local beer and view local art in the tasting room gallery. For dinner, check out local favorite The Peppermill. If the weather is nice, eat outside on the spacious front porch with a great view of Abingdon's quaint downtown. Be sure to ask for a peek at the murals covering the walls of the upper dining rooms. Start your day with a morning walk or bike ride on a section of the 34 mile Virginia Creeper Trail. Stop to shop a little at Holston Mountain Artisans, one of the oldest artisan collectives in the country. 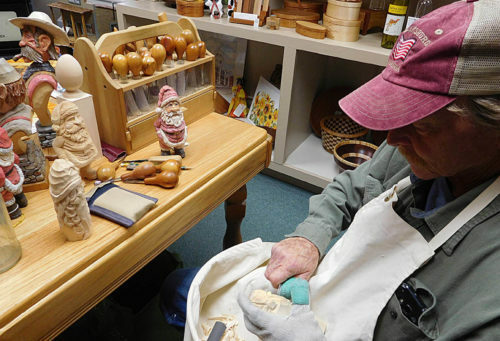 Juried members keep traditional Appalachian crafts alive through demonstrations and classes. Then visit artists working in their studios at the Arts Depot, housed inside a vintage train depot. Head over to William King Museum of Art and tour the galleries that showcase international art, contemporary regional art, cultural heritage works and folk art. After heading back to your B&B to freshen up, stroll down to Abingdon's oldest building, The Tavern for drinks and dinner before catching a show at the renowned Barter Theatre - check out Barter Stage II for smaller setting with edgier performances. After the show, grab a hand-crafted cocktail at Rain Restaurant & Bar. After checking out, grab a cup of roasted on-site coffee and a light breakfast at Zazzy'z - don't forget to check out the local art on the walls and a selection of local Appalachian authors. Spend some time driving around Abingdon's 20-block historic district and stop by one of Abingdon's unique art galleries to take home an original piece of art for your own home. The Gallery at Barr Photographics has been showcasing innovative regional artists since 2008, with six featured artists on display at any moment.